I give Caramello Koala’s a 5 out of 5 but I will say I won’t stop eating them until the packet is empty, so it does lose a point for the weight gain. Chocolate Freddo Frogs or Chocolate Caramello Koalas – how to choose? Thankfully with a yummy share pack you get the best of the chocolate world. 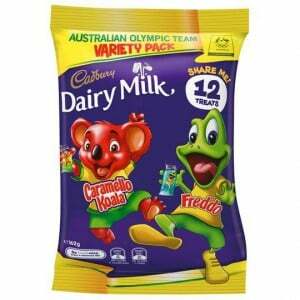 Cadbury freddo and koala have to be some of their best small chocolates on the market, so to have both in a bag…. It’s great because these are great sized treats for all. As a kid mum used to say “do you want the Freddos or caramello koalas?” and you would have the same one for 12 treats, this pack is great to allow you to alternate without buying 2 packs. I love to get these for my kids as a special. It’s nice to have two different types of yummy Cadbury chocolates to choose from. A great sharepack for everyone! Cadbury Freddo and Caramello is one of my favourite sharepacks,every-one loves both of the chocolate treats and l like the snack size for when you don’t want a bar! How would you rate Cadbury Dairy Milk Freddo And Caramello Koala Sharepack?